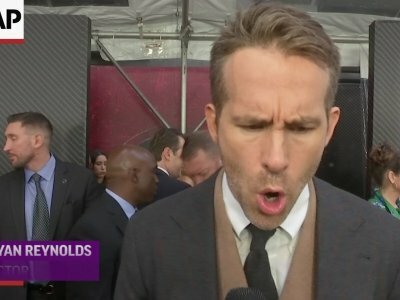 So hold onto your seats as Ryan Reynolds once more dons the red suit and katana swords for this saucy, overstuffed and very entertaining sequel to the 2016 massive hit “Deadpool,” which became the second-highest grossing R-rated film domestically after “The Passion of the Christ.” How do we know that? Deadpool happily brags about it in the new film, continuing his breaking-the-fourth-wall humor. Just some of the other things that get derided this time are “Yentl,” ″Frozen,” ″Stranger Things,” Wolverine, Jared Kushner, cultural appropriation, Brad Pitt, the Norwegian band A-ha, “Basic Instinct,” ″Robocop,” fanny packs, “Say Anything,” dubstep, “Sharknado” and Reynolds himself, who mocks his disastrous earlier decision to play Green Lantern. In this film, which reunites the original writing team of Rhett Reese and Paul Warnick, we begin by finding our unkillable mercenary in the same domestic bliss where we left him. But if “Deadpool” was an origin story, “Deadpool 2″ is a quest tale and our hero this time encounters the time traveling soldier Cable (Josh Brolin), a motley crew of mutants he calls X-Force — “Isn’t that a little derivative?” someone asks snarkily — and various superheroes and mutants, all set to a lively soundtrack that includes Air Supply, Peter Gabriel, “Annie” and an original song with filthy lyrics. If something can be oddly sweet while heads are being decapitated, it’s this film. Deadpool, of course, helps us along the film’s convoluted plot with such post-modern cracks as “Big CGI fight coming up!” or the put-down, “That’s just lazy writing” or, after a cool sequence, “Tell me they got that in slow motion.” Director David Leitch replaces Tim Miller but there’s been no noticeable change in tone or corrosion in the franchise’s terrific special effects. If anything, the surprising success of the original has resulted in more money and more insane sequences, like a chase sequence with a truck convoy and a bizarre scene when Deadpool’s legs regrow after he is cut in half, giving him baby limbs for a time. Reynolds is once again at his arch and nihilist best here, while acting and jumping in so much facial prosthetics that it makes him look like he’s inside melted cheese — or, as the first movie put it, an avocado that had relations with an older avocado. “Deadpool 2,” 20th Century Fox release, is rated R by the Motion Picture Association of America for “strong violence and language throughout, sexual references and brief drug material.” Running time: 119 minutes. Three stars out of four.